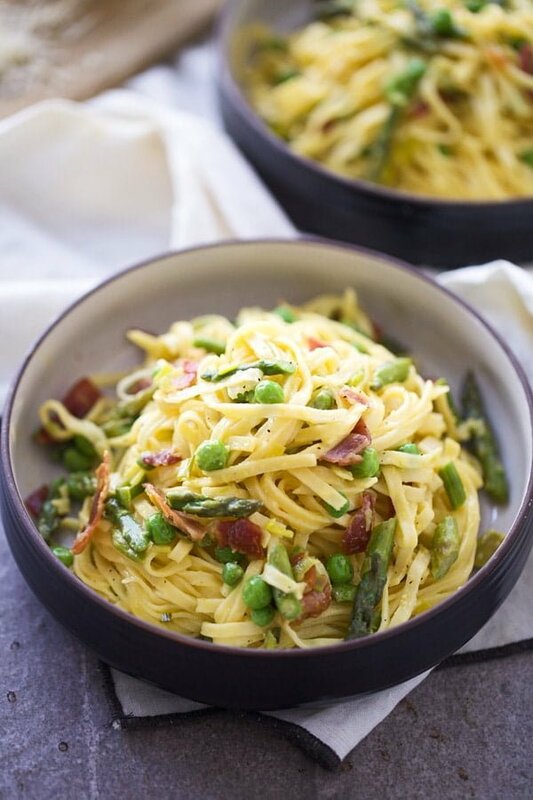 This Spring Carbonara with Prosciutto combines a light, creamy sauce with asparagus, sweet leeks and peas. It’s all tossed with strings of fresh linguine and just a hint of lemon for the perfect introduction into spring. Regardless of the season, pasta is something I eat quite regularly, even if it means I have to squeeze into a bathing suite in mere days. (My current reality.) It’s just something I can’t live without. Although instead of whipping up a super heavy and indulgent recipe (such as this Broccoli Cheddar Soup Mac and Cheese or this Creamy Gorgonzola Orrecchiette), in the spring I look to more seasonal ingredients and a (slightly) lighter, brighter preparation. 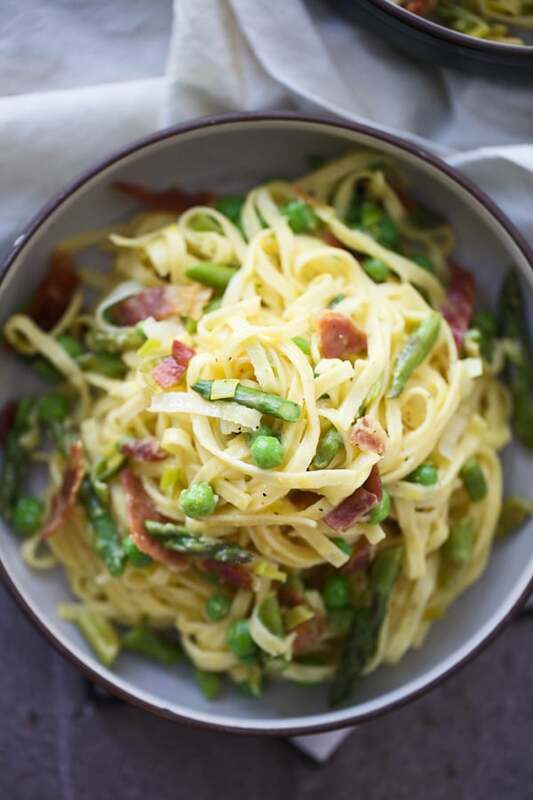 Enter: Spring Carbonara with Prosciutto. 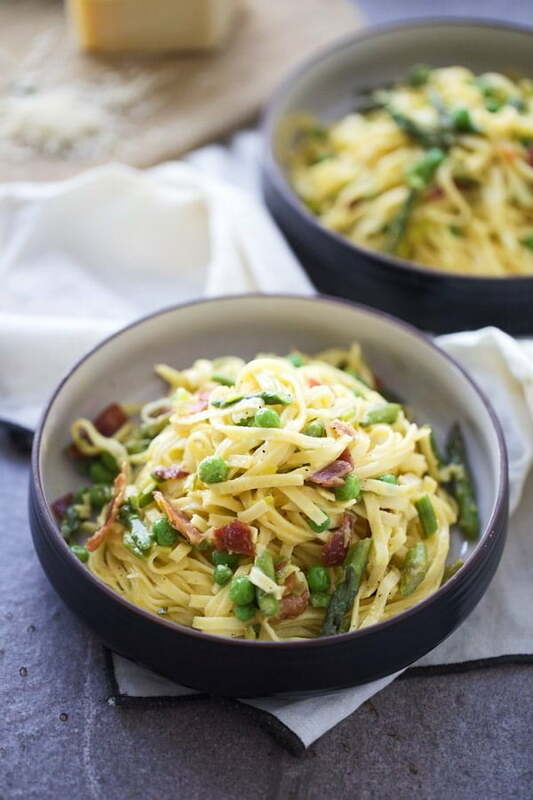 This springtime favorite combines all of my favorite bright, green veggies – asparagus, tender peas and sweet leeks – and pairs them with a super light, but flavorful carbonara sauce I can’t get enough of. If you haven’t tried to make carbonara at home yet, you’re missing out. 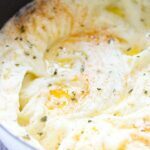 It’s one of my favorite ways to use minimal ingredients to make a creamy sauce, without having to actually add heavy cream or half and half. A true carbonara uses only eggs, cheese, salt and a little bit of pasta water to achieve the perfect texture, so that’s what I’ve done here. 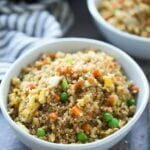 I also love that the egg not only acts as the cream component, but also adds a little bit of extra protein to the dish, something I’m always trying to incorporate more into my son’s diet. As most carbonaras go, this one is made with egg yolks, plenty of grated parmesan cheese (you can also use pecorino romano or grana padano) and the starchy cooking liquid from the pasta. To add a little bit of a bright kick, I threw in some freshly grated lemon zest – an addition I recommend you don’t skip. A classic recipe for carbonara will call for diced pancetta, but again, I wanted something a little bit lighter, so instead I crisped up a little bit of salty prosciutto in some olive oil. 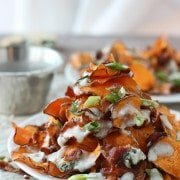 If you only have access to pancetta or bacon, no worries, it can be swapped out. Once the prosciutto is nice and crispy, another drizzle of oil is added to the pan, and the chopped leeks and asparagus go in. When the leeks are soft and sweet, and the asparagus are bright green, but still crispy, the pasta is transferred in directly from the boiling water and everything is tossed together. Next is where most people go wrong in carbonara. 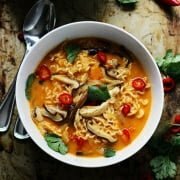 Because the main ingredient is raw eggs, and eggs cook quickly, a lot of people end up with scrambled eggs, which isn’t very appetizing when you’re expecting a creamy pasta sauce. The trick is to add enough starchy, hot pasta water to increase the temperature of the eggs. As I’m getting ready to add the mixture to the pasta, I like to turn the stove off completely to avoid cooking the eggs too fast. I then turn the heat back on VERY low until I’m finished incorporating everything. 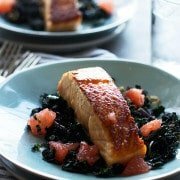 Serve with plenty of extra grated cheese, a big green salad and a bottle of your favorite rosé and this spring feast is ready to eat. A classic gets a bright update in this Spring Carbonara with Prosciutto. 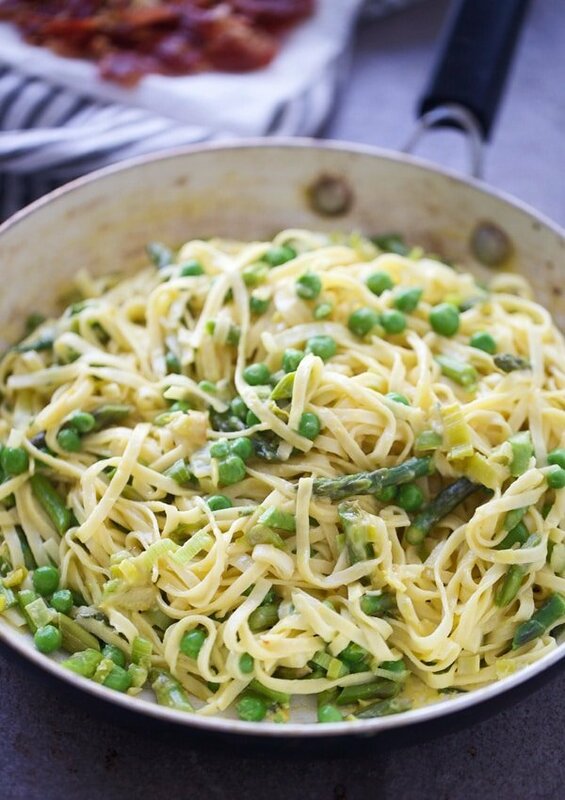 Crisp asparagus, sweet leeks and green peas are intertwined with linguini and a creamy parmesan sauce. Indulgent, yet light. Bring a large pot of water to a rolling boil. Season liberally with salt. Whisk egg yolks, 3/4 cup parmesan, 1/4 teaspoon salt and lemon zest together in a small bowl, set aside. Heat a large saute pan to a medium heat. Add olive oil. Add prosciutto and cook until crisp, about 3-4 minutes. Use a slotted spoon to remove prosciutto from pan, drain on paper towels and reserve fat. Add leeks to hot pan and oil. Saute for 1-2 minutes until softened. 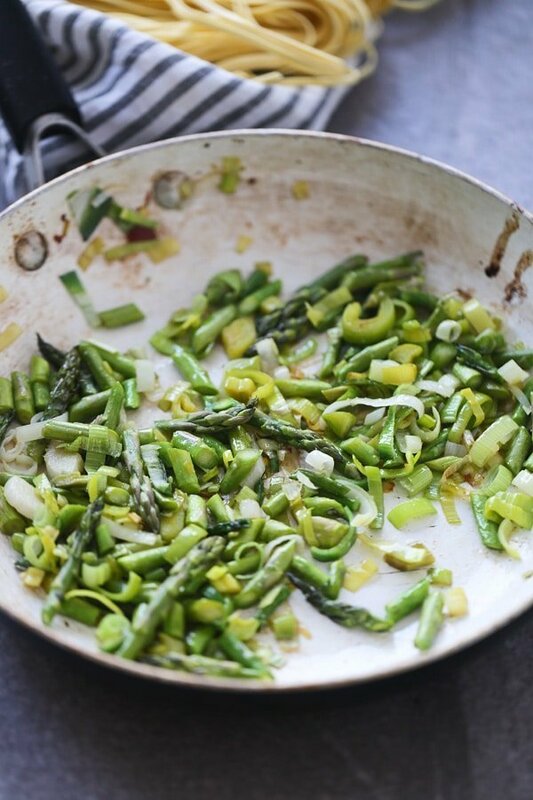 Add asparagus and 1/4 teaspoon salt, continue to cook another 2-3 minutes until bright green and tender. Turn the heat down to low. While the veggies finish cooking, add linguine to salted, boiling water. Cook for 2-3 minutes until aldente. Use tongs to transfer pasta to leeks and asparagus, along with remaining salt. Reserve pasta water. Slowly whisk in 1/4 cup of the hot pasta water to the egg and cheese mixture, then add to the pasta along with the peas and remaining salt. Continue to toss the pasta with the egg mixture over a low heat until a sauce forms, about 3-4 minutes. Add remaining cheese. Toss. If necessary, add more pasta water a few tablespoons at a time to loosen the sauce up. Add the prosciutto back in, toss and then season to taste with salt and pepper. 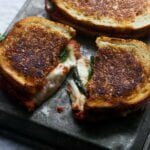 Garnish with cheese. One Response to "Spring Carbonara with Prosciutto"